The Future of Golf 1- Is it all about length? Readers will be familiar with my musings on where the game of golf is going. We all know that the ageing baby boomers are not being replaced by younger generations at golf clubs, and that clubs all over the world are merging, consolidating, and looking at other revenue streams to future proof their operations. Modern life is busy and working generations find it hard to justify the half day required to play golf. Nine hole competitions, and oversize holes are suggestions that might help speed of play or time away from work and family. In 2016 I attended a conference in the USA, and was invited to visit the base for U.S. Kids Golf at Longleaf GC, near Pinehurst.Their concept is interesting: Basically they try and set up a course so that it has many different tees, and each individual plays coloured tees appropriate to the length they hit the ball. The objective is to allow women or children, or anybody to hit the same club to the green as a professional would off the championship tees. So if the pro plays a particular par 4 by hitting driver, 7 iron and then has a birdie putt, the theory is that the child off the correct forward tee could potentially hit the same clubs and also have a birdie putt. And to determine the correct tee, the driving range is set up with colour coded posts that correspond to the tees should play. 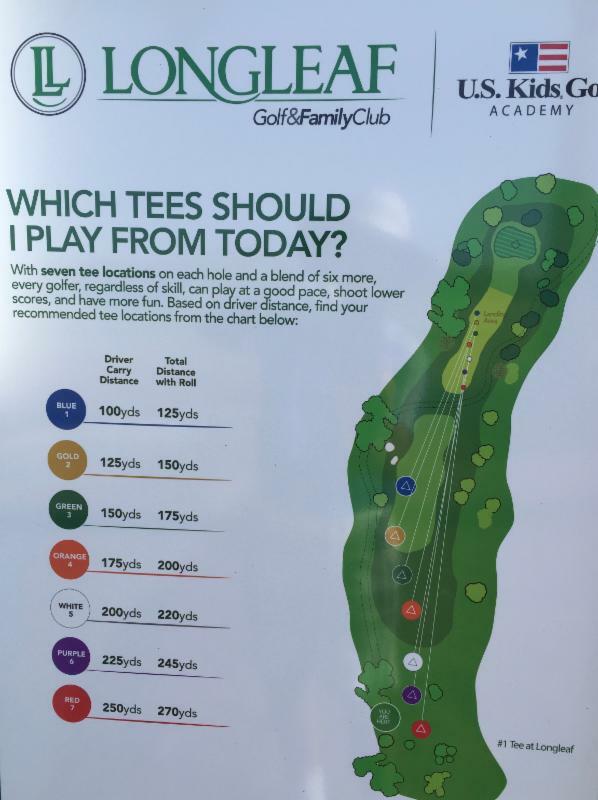 So if you hit your driver 180 metres, and that is closest to the purple post, you play off the purple tees. The Longleaf tee selection system. Off course the theory has some practical flaws- for instance the fairway hazards are not necessarily in the optimum strategic position for each tee, and it can be a little tedious if a group of four all hit off different tees. But it definitely has merit and the Longleaf course is fun to play. After the conference I was fortunate to play some of the better courses on the east coast of America, and I played Sebonack with architect Tom Doak. Again distance was a topic of discussion. At Shinnecock Hills, the course was in magnificent shape, and it looked and played like a real championship course. It was a thrill to play it. But even off members tees the course challenges you with length and fast crowned greens. Magnificent as it was, I wouldn't choose to play there every day. 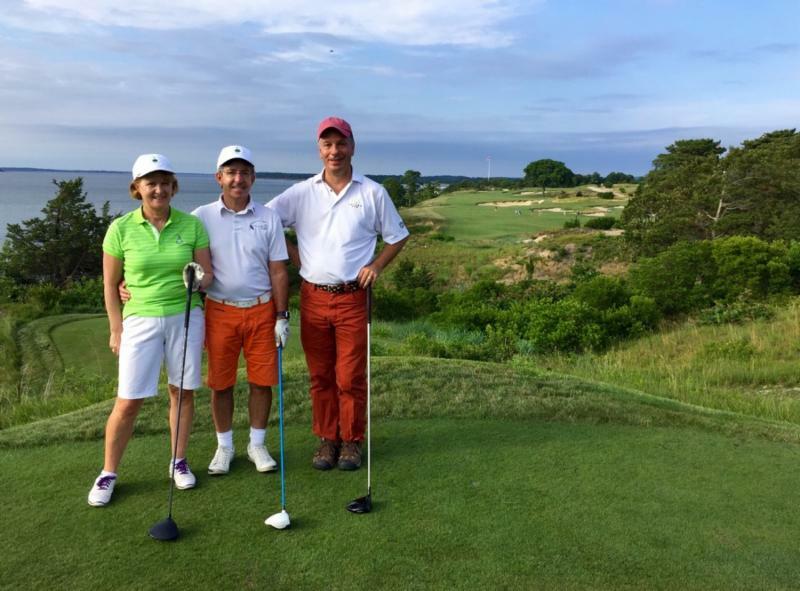 Then we played Sebonack with Tom Doak, and we actually played off a forward tee. Doak said that the members that said they enjoyed the course the most were those playing off the shorter tees. And we did enjoy it. It is nice to have a birdie putt every now and then, and play every club in the bag. 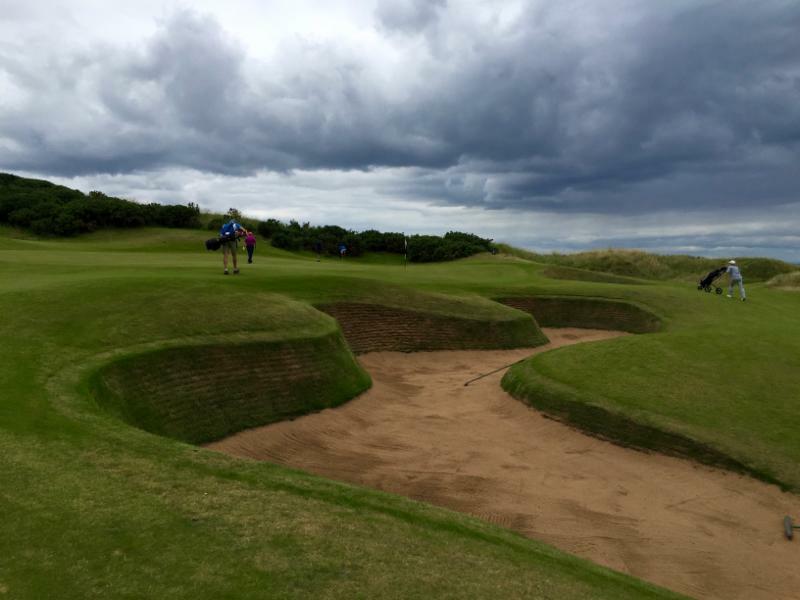 Finally we had a great meeting with the managers at Kingsbarns GC in Scotland, and we were impressed with how knowledgeable, and businesslike they were with the operations of the course. By altering a few key tee positions for length they have changed the percentage of players playing on the forward tee to the regular tee from 50/50 to 85/15. The result- playing times decreased significantly, and feedback on the course improved through the roof. There is a message in their somewhere! For me, I won't be shy about playing off forward tees when the opportunity arises- perhaps not all the time- but the fun factor is more important to the game going forward..if we could get that message across maybe the kids of today will want to pick up the game too. What’s abundantly clear from talking to architects across the world is that the way that golf is marketed has caused untold problems for both the art of golf course design, and for the game as a whole. The phrase ‘championship course’ is perhaps the biggest single issue. What is a championship course? Well, logically, it is a course on which championships are held (I shall steer clear of an extended debate on what constitutes a championship). But hundreds, perhaps even thousands of courses described in their marketing literature as ‘championship’ have been built across the world and have never hosted a significant professional or top amateur event, nor ever will. So perhaps we have to come to a looser definition: a championship course is one which could host a championship, if the need arose. Ask any golf architect, and you’ll hear the same refrain. Clients demand ‘championship’ courses, no matter where in the world they are, whatever the average standard of players who will frequent them day in day out, or how unlikely it is that AN Other pro tour will ever drive into town and seek to host an event there. “The biggest group of golfers is that with handicap 26 or higher. They pay the bills!” says Dutch designer Michiel Vandervaart. “The gap between the novice and the professional tour player will only get bigger.” And in emerging markets, where most local golfers are just learning the game, this issue is even more important. Across the developing golf world, we see championship course after championship course; fine for the pros, but pros play for free. If golf is ever to embed itself in the sporting culture of these new countries, it needs more courses that are designed from the bottom up to appeal to average and below average players. Mark Parsinen, the developer and co-designer of Castle Stuart in Scotland – as well as previously developing the much-admired Kingsbarns – takes a similar view. But he goes further, and says that even for elite players, golf is more interesting when the course is more playable. “Golf is inherently a game of errors and recovery, not of perfection,” he says. “The best 150 players in the world typically only hit nine of 14 fairways and only hit 12 of 18 greens in regulation. The fascination of the game is the intermittent great shot coupled with recoveries; and the heart of engaging design is to make the recoveries interesting and varied and to make them less about difficulty at your feet – about issues that have to do with lie, stance, elevation differentials, and a target that offers choice – take on the difficulty now and get an easier next shot, or take the easier shot now and defer the difficulty to the next shot. Fellow American architect Andy Staples says that the fixation with difficulty leads to some odd results. “A really interesting example of difficulty for players of different abilities is the current condition of many championship courses – Oakland Hills comes to mind – where it is actually best for the average player not to ‘play it forward’, but to play a longer set of tees. By playing a longer yardage, poorer players can simply avoid the difficult bunkers by not reaching them from the tee. The course is set up in such a linear fashion, with difficult hazards and little room to avoid them, that playing short of all the bunkers is often the best option. This is a great example of how a design can affect the levels of difficulty for players of different standards. “We’ve finally learned that golfers don’t like golf very much when they get beat up and lose balls, especially when they’re not on the ocean or in the sand dunes. This is the one area where I feel the characteristics of a site really is impactful on creating a course where golfers ‘play well’. I also love designing ‘quirk’ into a course, and in most cases, it takes multiple rounds to appreciate these specific details. When done properly, a player is left with the idea that there is more to this course, and they feel the need to play it again. The courses at Bandon do a very good job of this. Tripp Davis, himself an elite, plus handicap golfer as well as a successful architect, has unsurprisingly thought pretty hard about how to challenge players of different standards. “Better players are challenged by stricter margins of error and tougher conditions, but I also firmly believe that multiple meaningful options will challenge the better player,” he says. “Require them to choose an option and commit to that option with the precision required to score well at their level. I regularly try to create a dilemma between being aggressive and ‘smart’ for this player. If you only give a good player one reasonable or meaningful option, they will tend to pull that shot off if it fits their eye or are generally playing with confidence. Options can introduce doubt. Whereas options can subtly challenge the better player, a lack of options will challenge the average player. They need optional ways to play to their handicap on average. We do need to be mindful that this player does want to be challenged, so we cannot eliminate it completely, but we have to give them options to choose routes that are playable for them. “It can all fit in one course, but flexibility in the design and how it can be set up, relative to conditioning and the location of tees and pins, is critical to making a course capable of being a challenge and being enjoyable. Part of making the design work is strategising the play of the game from each tee for a variety of player types, making sure there are options to avoid stricter margins for error. In doing so, the golf course architect needs to recognise that a 10 handicap is theoretically going to make 10 bogeys in a round, so while there may be stricter angles for getting an approach shot close to the hole, we have to design options for this player to strategically play for bogey from tee to green, noting that a bogey for a 10 handicap is their ‘sense of par’ on 10 holes. With the impending U.S. Open at Erin Hills, I have been keen to see how the U.S.G.A set up the course. Erin Hills is regarded as a very nice, natural course on a rolling sand base. The U.S.G.A. has been setting up the Open with the mantra that ‘par’ will be defended, and the course will be set up to test every aspect of these elite player’s games. I am sure we will see a magnificent exhibition of power golf, and hopefully get an exciting finish. The ultimate winner will have to play amazing golf- hitting obscene distances, and displaying an iron will. Golf is fighting for it’s future and needs to capture the imagination of the public, and bring people to the game. When I saw this little video of the rough at Erin Hills- it hit me like a two ton truck. Maybe, they just don’t get it? Surely we need courses, and course set ups that allow players with different skill sets to play their way. Bring back creativity as an option I say! I would rather play a course which has me thinking about different options, and making decisions than a course which demands length and precision only. The Travelling Golfer World Course Ratings & Reviews will be published in the months ahead and will focus more on the courses that engage, and intrigue the everyday golfer than the beautifully manicured championships courses which provide an exacting test of our games. Golf is a good walk with friends in a beautiful setting. We have magnificent visual settings, and if we play interesting, challenging, intriguing golf holes surely the game will flourish? So for our highly publicised championships how good would it be if the playing arena inspired people to take the game up. How good would it be if we had kids and grandads alike trying to emulate little flips and flops, putts up and down dale from 60 feet, and bending shots around trees? There will be some who aspire to hit the 300 metre drives, and that’s super- but the masses just wanna have fun!